Second-generation groov Box industrial appliance distributes automation systems to mobile devices with faster operation, wider operating temperature range, and smaller footprint. Users simply connect their automation system to groov, and then connect authorized mobile devices to groov via either a web browser or an app interface. This allows each mobile device to interact with the automation system in a secure and predefined manner. Sontay is enhancing its wireless offering by launching the second phase of the ground-breaking SonNet system. Now incorporating a new CO2 sensor and innovative I/O module, SonNet offers system integrators, building consultants and end-users the opportunity for smarter measurement and control without the need to install cabling. This in turn will offer vast benefits for occupant comfort and enhanced energy savings. GE announced a series of ZigBee-enabled bulbs that integrate out of the box with the newly announced Wink home automation hub, a product of GE’s Quirky business. In addition to the A19 version, GE will offer a BR30 model for less than $20 and PAR38 for under $25. Here are the details: 60-watt replacement soft white (2700K) LED bulb, or A19 shape, commonly used for general lighting in table and floor lamps. Indoor soft white (2700K) floodlight LED, or BR30 shape, installed as downlighting found in dining room, living room or other entertainment spaces. Indoor/outdoor-rated bright white (3000K) spotlight LED, or PAR 38, used for outdoor security or spotlight. The products will be available for pre-order via HomeDepot.com this fall. Honeywell’s Lyric thermostat: comfort, savings, life in tune. Honeywell has turned up the heat on the connected home space, launching the new Lyric thermostat. Based on your smartphone’s location, the Lyric thermostat is able to seamlessly deliver heating/cooling comfort when you’re home, and savings when you’re away, no learning needed. It’s the first offering in a new family of innovative connected home products from Honeywell. • Lyric app – available for iOS and Android smartphones and tablets, the Lyric app provides full control of the Lyric thermostat from most anywhere. • Fine Tune – automatically factors indoor and outdoor temperature, humidity, and weather into its algorithm, to provide the most comfortable temperature for homeowners. No other do-it-yourself Wi-Fi thermostat on the market does that. • Smart Cues – the Lyric thermostat provides updates on your heating/cooling system, and lets you know through the Lyric app if a filter needs to be changed, the temperature has gone too high/low, and other key updates. The sensorProbe Series is a simple, accurate and field proven sensor monitoring device. The sensorProbe supports a wide range of AKCP Intelligent Sensors which are automatically recognized when plugged in. AKCP supply sensors that monitor temperature, humidity, water leaks, airflow, voltage drops as well as extreme high and low temperature. The sensorProbe is designed to last for years and will monitor your equipment's environmental variations. It will notify you via E-Mail or SNMP Alerts in advance, preventing disaster. You can try the sensorProbe2's full features over the internet using real, live data. There are no downloads or installations required. All you have to do is click on this link (akcp.dnsalias.net:8002) and click the Login button to gain quick and free access to AKCP's best selling sensorProbe2. IntesisHome®, the service in the cloud for the control of air conditioning, drastically extends the compatibility with different brands and models with its new Universal Controller. The new Universal Controller, available now on sale, provides compatibility with a great list of air conditioning brands, including Fujitsu, Fuji Electric, General, Hiyasu, Kaysun, LG, Midea, Mitsubishi Heavy Industries, Panasonic and Toshiba. In the coming days we will expand compatibility with many other brands, including Daikin, Mitsubishi Electric, Samsung and Sanyo. MultiTouch, a world leader in interactive display systems, announced a partnership with Bluescape, a cloud-based visual collaborative workspace. This new solution allows employees to connect virtually across any platform at any time to interact, create, and share breakthrough ideas while accelerating projects and decisions. MultiTouch iWall and MultiTaction Cell 55” ultra-thin bezel (UTB) now supports Bluescape, allowing for real-time engagement and responsiveness. The immediate engagement is further enhanced with MultiTaction’s ability to support the concurrent use of hands and IR pens separately, independently and simultaneously, allow for users to pull together existing data, applications, workflows, and processes. 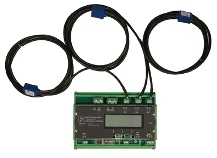 NK Technologies introduces the APN-R Series Power Monitor, which measures the power usage of a single piece of equipment, an extensive machine system, an area of a plant, or an entire facility. The APN-R is equally suited for large scale plant energy management applications, as well as specific equipment monitoring tasks, such as detecting conveyor jams and overloads, or identifying dry running pumps caused from clogged intake or discharge lines, impeller cavitation or bearing wear. This new range offers unprecedented flexibility as the products together allow the creation of "clusters" of input and output points in any combination to match to your exact project requirements, and linked together either wirelessly or with a wired serial network. These modules are designed to work as part of our wireless energy management system, which offers the most cost-effective way to retrofit monitoring and controls into existing buildings, due to the rapid installation and simple configuration. The MX range consists of "slices" which simply plug together on DIN rail to form a "cluster". Each module type offers a specific functionality so the cluster size and composition can be exactly matched to the application requirement, avoiding unused points, and allowing for easy expansion.